Lying halfway between Lisbon and Oporto in the Beiras region of central Portugal, venerable Coimbra nestles on the banks of the River Mondego in dignified glory. Famed for its university - the oldest in the country - and a fantastic collection of handsome churches, serene monasteries, and lively cultural institutions, Coimbra is also a busy commercial hub with its many shops, boutiques, and appetizing choice of cafés and restaurants. The city center is divided into two neighborhoods, the Lower Town and the Upper Town. Its historic heart lies high above the Mondego on Alcaçova hill, known to the Romans as Aeminium. 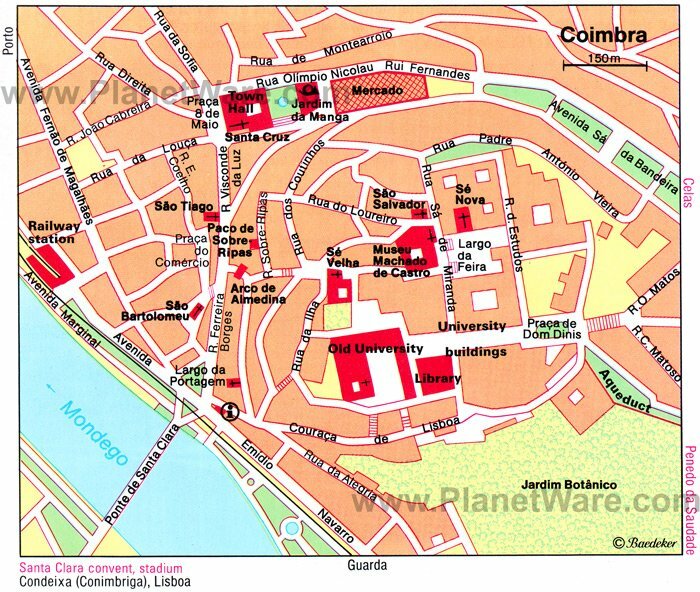 Here, medieval convents, cathedrals, and some fine museums cluster around the old University. Kings were born in Coimbra; they are entombed here, too. Indeed, it was once the proud capital of the Portuguese nation. This royal heritage permeates the city's steep hills, narrow lanes, and verdant parks, all of which are best explored on foot. And exploration further afield is rewarded with the largest and most compelling Roman site in Portugal, and an emerald-hued forest of enchanting allure and breathtaking beauty. The University of Coimbra is one of the oldest universities in Europe. Interestingly, it was originally founded in Lisbon in 1290 by King Dinis, but was transferred to Coimbra in 1537 and located in what used to be a medieval palace. Partly rebuilt in the 17th and 18th centuries in Baroque and neo-classical styles, this is the Old University where some of the most celebrated tourist attractions in Coimbra can be found. The stunning eye-opener that is the Biblioteca Joanina is reason enough to visit this venerable institution. The 18th-century library, named after its benefactor, João V, is a sumptuous feast of gilt and exotic wood and trompe-l'oeil decoration. The lacquered bookcases are lined with nearly 300,000 medieval books and manuscripts from all parts of Portugal. Another scene-stealer is the Capela de São Miguel. Architectural elements of this beautiful chapel date from 1517, but most of what you see today is 17th and 18th century including the fine azulejos (tiles) that embellish the walls of the nave and chancel. The Mannerist altarpiece dates from 1605. The chapel's showpiece is an extraordinary Baroque organ lavished with gilded angels. Outside, a sweeping courtyard provides edifying views across the city; the bell tower is a cherished symbol of the university. Afonso Henriques and Sancho I, the first two kings of Portugal, are entombed in Santa Cruz church, which forms part of a monastery founded in 1131 by the canons of St. Augustine. The Romanesque church is noted for its Manueline façade attributed to Diogo Boitac, who was also responsible for designing the chapterhouse. In fact, Santa Cruz's form has been chiseled out by some of the 16th century's finest sculptors, noted exponents like Nicolau Chanterène and Jean de Rouen, whose carvings ornament the church's Portal da Majestade. The extravagantly traced royal tombs are also said to be Chanterène's handiwork. A sightseeing highlight is the serene Claustro do Silêncio, a double-tiered Manueline cloister featuring outstanding bas-reliefs in the southwest and northeast corners depicting Christ's Passion. An elaborate Renaissance fountain provides a centerpiece water feature. The Old Cathedral is more akin to a fort such is its solid, almost oppressive appearance - all crenelated walls, narrow window-slits, and heavy-set veneer. In fact, this is one of the finest examples of Romanesque architecture in Portugal. Consecrated in 1184, King Sancho I was crowned here shortly afterwards when Coimbra was the nation's capital. There are flourishes of extravagance relieving the sombre effect of the exterior: the elegant Renaissance Porta Especiosa on the north side of the church is the most obvious example. Otherwise, tourists need to venture inside to appreciate more ostentatious design signatures such as the gilded, late Gothic high altar, which dates from 1498. The fancy retable, which depicts the birth of Christ and the Assumption, is the work of Flemish master wood-carvers, Olivier de Gand and Jean d'Ypres. Incidentally, the square in front of the Old Cathedral is where João I was proclaimed king in 1385. The fussy tapered façade of the New Cathedral contrasts starkly with its older, more conservative namesake. But it can hardly be described as contemporary; this church was founded by the Jesuits in 1598 and consecrated in 1640. The exuberance of the exterior is equaled by the opulence of the interior - the high altar of gold filigree standing majestically in the 17th-century chancel is a standout feature, the pair of 18th-century organs positioned either side lending form and function. Actually, there is a bit of the old in the new: the octagonal font and the choir stalls once belonged in the Sé Velha. A cruise on the Rio Mondego is one of the most relaxing things to do when sightseeing in Coimbra. The city's venerable patina is clearly visible from the river, and drifting lazily along this ancient watercourse affords visitors an appealing and wholly different perspective on this beguiling destination. A novel option is to combine a cruise with a tour of Coimbra by tuk-tuk. These motorized, three-wheeler cabs scooter through the city's streets and lanes with alarming ease to access places a conventional vehicle just wouldn't manage. Another more romantic idea is to look out for evening cruises that offer passengers dinner onboard accompanied by performances of fado, which in Coimbra is sung in a more light-hearted manner. Re-opened to the public after undergoing an extensive redesign by respected architect, Gonçalo Byrne, the Machado de Castro National Museum (MNMC) - named after the famous Portuguese sculptor, Joaquim Machado de Castro (1731-1822) - is one of Portugal's foremost cultural institutions. The new space boasts five floors, offering three times more exhibition space than in its previous incarnation. The permanent displays of Roman archaeology, which include a remarkable cryptoporticus, 12th to 18th-century southern European sacred metalwork, 14th to 18th-century jewelry, and one of the finest collections of medieval statuary in Portugal that spans the 10th to the 18th century is supplemented by rare and valuable paintings, drawings, textiles, furniture, and ceramics. And if that isn't enough to take in, MNMC also possesses other important collections of early books and manuscripts, as well as glassware and artifacts from the Far East. A worthwhile diversion away from this magical hoard is the double loggia in the courtyard that affords inspiring views over the town. The evocative, partly sunken ruins of the Convent of Santa Clara-a-Velha are all that remain of the 13th-century monastery. Built on the south bank of the River Mondego, the building served as a retreat for Santa Isabel, the widow of King Dinis. Isabel oversaw the construction of a new church where she was interred after her death in 1336. However, the death knell was also sounding for Santa Clara itself after consistent flooding undermined the convent's foundations. The building was eventually abandoned in 1677, the sisters opting for a new building on higher ground. In 1696, the remains of Isabel herself were moved to this new address, the Convent of Santa Clara-a-Nova. Velha's original Gothic church was eventually restored and shares the site with a modern interpretation center where visitors can learn more about the fascinating history behind the convent and mull over archaeological finds unearthed from the silted ruins. The Convent of Santa Clara-a-Nova, built between 1649 and 1677, replaced the earlier monastery, which succumbed to flood water and had to be abandoned. The new convent, built on drier land at Monte da Esperança, on the same side of the river, is now part of a military barracks, but it's still possible to visit the 17th-century silver shrine of Santa Isabel inside the Baroque church. The saint's original stone sarcophagus lies empty in the lower choir. Worth noting are the sizable cloisters, laid out in 1733 by Carlos Mardel. Besides a small military museum, the rest of the rooms are off limits to the general public. Part of the original gateway to the old city, the Almedina Arch is a relic of Coimbra's Moorish town walls (in Arabic medina means town). The oldest part of the structure dates from around the 9th century and originally consisted of a pair of turrets linked by an arch. It was greatly altered and restored in the 12th century to include the Torre de Anto, built above the arch replete with Renaissance windows. Today, the tower houses the Centre of the Walled City interpretation center that recounts the history of the defensive walls that once surrounded Coimbra. An annex provides space for temporary exhibitions and talks on related themes. The city's botanical gardens are the most expansive in Portugal. Integrated into the University of Coimbra's faculty of natural history, they were created by the Marquês de Pombal during the reform of the university in 1773. Landscaped on valley terraces near the river, the entrance to the verdant 20-hectare estate lies under the shadow of the 16th-century aqueduct of São Sebastião. The exuberant and exotic collection of flora numbers some 1,200 plants and trees from around the world. Several greenhouses, one dating from 1856, are used for cultivating sub-tropical plant and flower species. The gardens feature several ponds and a central fountain and, hidden amongst dense vegetation, the tiny 19th-century Capela de São Bento. Grown ups are welcome at this imaginative theme park, the name of which translates as "the little ones of Portugal." That's because everything here is a world in miniature, a thoroughly amusing exhibition of scaled-down versions of Portugal's most cherished national monuments, finest buildings, and traditional villages. Coimbra is represented by its old university. There are also buildings from former colonies (the park was established in 1940). A learning-through-play park basically intended for children, adults will also have fun exploring this Lilliputian landscape. Within the grounds are three museums specializing in furniture, traditional costume, and naval artifacts. Portugal's own tragic version of Romeo and Juliet was played out in the Quinta das Lágrimas gardens (in Portuguese lágrimas means tears) where lady-in-waiting Inês de Castro, the mistress of King Pedro I, was murdered in 1355 on the orders of Afonso IV. The deed was said to have taken place in the gardens of a villa near a fountain - the Fonte dos Amores. The villa is now an upscale hotel, but the grounds, planted with ancient trees and landscaped with ponds and watercourses, are open to the public. 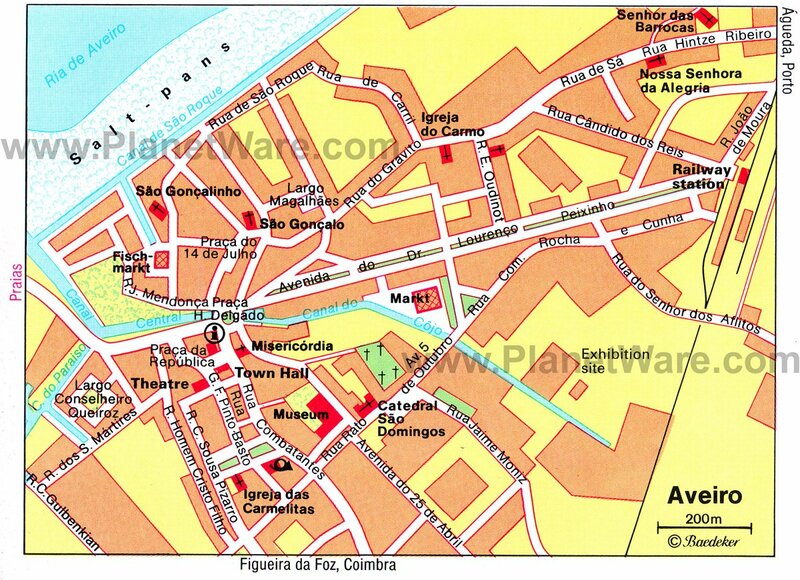 Coimbra's busy main square is the city's commercial hub. Lined with shops, boutiques, cafés, and restaurants, it's also a popular tourist attraction in its own right. In one corner stands the church of Sao Tiago. Consecrated in the 12th century, its façade has been heavily restored, but inside, an altarpiece dripping with dazzling gilded wood greets admiring sightseers. The outside of the building is particularly alluring at night when it's illuminated. Just off nearby Rua Ferreira Borges are the aforementioned Arco de Alemedina and Torre de Anto. Luxury Hotels: By the river, less than a kilometer from the center, all rooms at Vila Gale Coimbra have balconies; there's also free breakfast, an outdoor pool, and a spa. The nearby Tivoli Coimbra Hotel has large rooms, city views, and inexpensive parking. In the same area, Hotel Dona Ines has an outdoor pool and free parking, a 10-minute walk from the historic center. Mid-Range Hotels: On a main street right in the center, close to historic sights and restaurants, Hotel Vitória offers free breakfast. On the river bank next to the old town, the nicely decorated Hotel Oslo Coimbra has panoramic views over the old town from its terrace and breakfast room. The charming Belle Epoch Hotel Astoria is right in the center, with an elegant interior and rooms with balconies overlooking the river. Budget Hotels: The basic Ibis Coimbra overlooks a riverside park below the university, five minutes from the old town. A short stroll to the heart of the old town and a five-minute walk from the train station, Almedina Coimbra Hotel includes a complimentary breakfast. High in the steep, narrow streets of the upper old town (so not a good choice for those with heavy luggage), the hospitable Casa Pombal offers free breakfast on a cozy roof terrace, near the Old Cathedral and university. 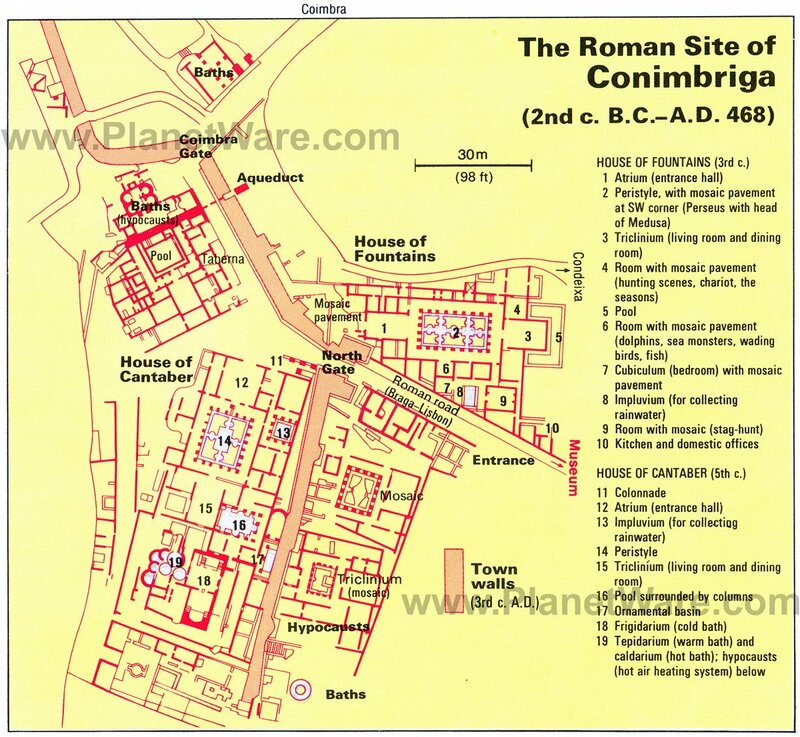 Things to do outside Coimbra include exploring the sprawling and wonderfully evocative Roman ruins at Conímbriga. Located 15 kilometers southwest of the city, this archaeological treasure dates from the 2nd century BC and is the most extensively excavated Roman site in Portugal. Clearly once a substantial town, the foundations of many houses; an elaborate system of baths; a forum replete with market place, shop entrances, and a nearby temple; plus an aqueduct have been uncovered. Excavations have also unearthed a number of exquisite floor mosaics, some astonishingly intact and covered to protect them from the elements. The finest and most luxurious buildings date from the latter days of the Roman Empire, from the 2nd and 3rd centuries AD. These include the Casa das Fontes, a huge villa complex built around beautiful colonnaded gardens and a series of fountains. Similarly, the grounds of Casa de Cantaber are embellished with ornamental pools. Both are noted for their remarkable mosaic floors. After pondering this ancient urban wonder, visitors can browse the excellent Museu Monográfico de Conímbriga. The museum explains the history of the site and displays a wealth of artifacts discovered on-site and presented thematically. The Buçaco National Forest, which lies 25 kilometers northeast of Coimbra on the northern slopes of the Serra do Buçaco, is virtually unrivaled in its scenic beauty and richness of vegetation and definitely worth a diversion. It's a magical and mysterious destination, and an ideal excursion for tourists based in Coimbra. At 105 hectares, the forest is generous in its geography, and while it's possible to drive through, this is an environment worth exploring on foot. A network of walks crisscross the park leading to secret vales, cascading springs, hermits' grottoes, and historic monuments. Along the way, visitors can admire some 700 native and exotic species of trees, including venerable cedars, ancient ginkgos, and swaying palms. Buçaco was originally a monastic retreat, and a cork-lined Carmelite monastery dating from 1628 as well as several moss-covered chapels are hidden away in the undergrowth here. In 1810, the park echoed with gunfire as British and Portuguese troops, led by Wellington, routed French forces in a decisive battle along a ridge high above the forest, marked today by a lofty victory obelisk. At the park's center is the remarkable Palace Hotel Bussaco, an early 20th-century former hunting lodge commissioned by King Carlos I. The Neo-Manueline folly, designed by Italian architect Luigi Manini, is noted for its sumptuous tiled interior. The luxury property is now one of Portugal's great hotels. About 40 minutes northwest of Coimbra, the old port and fishing town of Aveiro lies on the east side of the Ria de Aveiro, a fish-filled lagoon. As well as being an attractive town, Aveiro boasts beautiful beaches and fine alluvial countryside along the lagoon's winding waterways. Aveiro is often compared with Amsterdam or Venice, despite having only three canals, and a trip on the traditional boats, called barcos moliceiros, shows Aveiro at its most appealing. Along the way, visitors can see some magnificent Art Nouveau buildings and house fronts decorated with azulejos. Top tourist attractions in Aveiro include the Catedral de Sao Domingos, presented to the Dominicans by the Infante Dom Pedro and consecrated in 1464. Opposite the cathedral, the former Dominican convent, Convento de Jesús, houses the Museu de Aveiro. This impressive museum displays an excellent collection of Portuguese Baroque art, as well as sculpture, archaeological exhibits, and pictures of the 15th to 18th centuries. In the vestibule of the church is the Baroque tomb of St. Joana (1699-1711, by Joao Antunes). About 110 kilometers from Coimbra, the picturesque little fishing town of Nazaré lures large numbers of visitors thanks to its pleasant beach, colorful Phoenician-style fishing boats, and quaint local customs. It is now one of the most popular seaside towns on this part of Portugal's Atlantic coast, the Costa de Prata. For tourists, Nazaré's charm lies in the feel of being in a little town imbued with tradition. 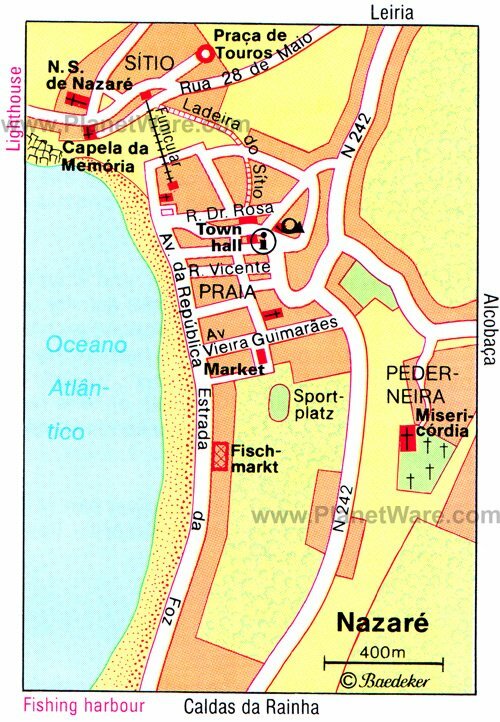 The people of Nazaré still wear their traditional costumes for special occasions and folk dancing, and although the building of the harbor has shifted most of the fishing activity to the southern part of town, tourists still share the sizable beach with fishermen drying their catch on wire racks. For beautiful views over the town, climb 100 meters in a funicular to Sitio, on the small promontory of Monte Sítio. 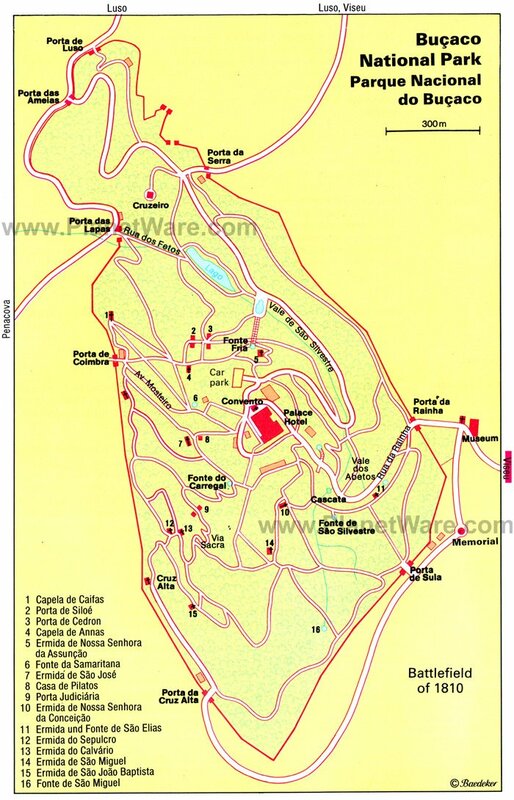 You can also access the viewpoint by car or by walking up the steps of the Ladeira de Sítio. Another tourist attraction is the Capela da Memória, founded by a local dignitary Dom Fuas Roupinho, who was reputedly saved from tumbling over the cliff here by the Virgin Mary. Near the chapel, look for the pillar, which commemorates Vasco da Gama's visit here after his voyage to India. Opposite the Capela da Memória, the 17th-century pilgrimage chapel of Nossa Senhora de Nazaré contains an image of the Virgin, which is revered as miraculous. The annual pilgrimages here on August 15 and in the second week of September attract visitors from near and far. More recently, Nazaré has become the focus of big wave surfing. The awesome winter swells crashing onto the sand at Praia do Norte produce some of the biggest rollers ever seen - and ridden! In 2011, American surfer Garrett McNamara rode into the record books by surfing a 24-meter swell, the largest ever officially recorded. Two years later he caught another massive wave with a possible height of 30 meters. Conveniently located in Portugal's central Beiras region, Coimbra lies close to several sightseeing hot spots including Parque Natural da Serra da Estrela, a wild and untamed mountain range ripe for hiking, and one of the best places to visit in Portugal. For a better idea of where to travel within the region, take a look at the Coast and Countryside article in our Portugal itineraries page. Venture further southeast and you can discover the Alto Alentejo (Upper Alentejo) and all the history and culture this area of Portugal has to offer. Actually, this is where you'll also stumble upon some wonderfully evocative castles, many in a remarkably good state of preservation considering their age.